A chocolate lab dog named Max is ready to ride as he sits on the back of a motorcycle in the downtown area of Halifax in Nova Scotia, Canada. 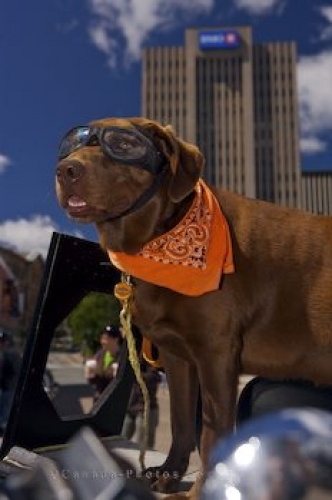 This dog is looking extremely cool sporting his glasses and orange scarf as the sun glistens off the motorcycle. Picture of a cool dog ready to flee downtown Halifax, Nova Scotia on the back of a motorcycle.